Lowest Prices for the best tools from Performance Tool. 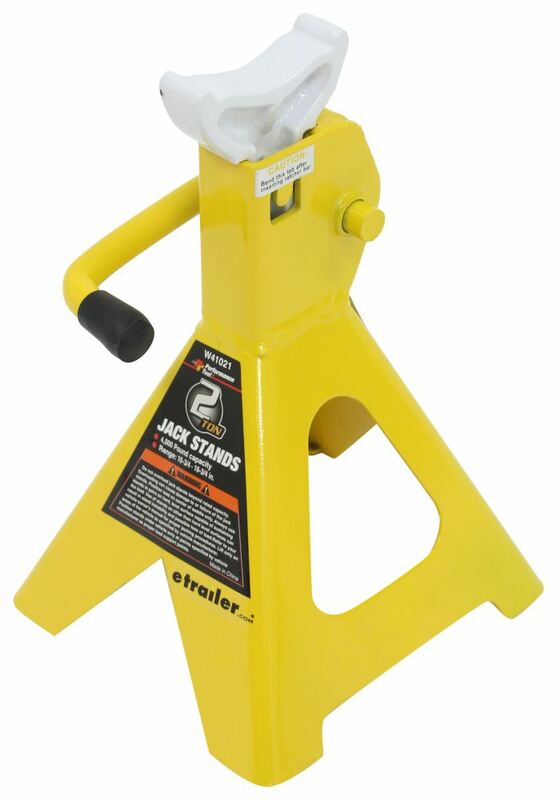 2-Ton Jack Stands - Qty 2 part number PTW41021 can be ordered online at etrailer.com or call 800-298-8924 for expert service. 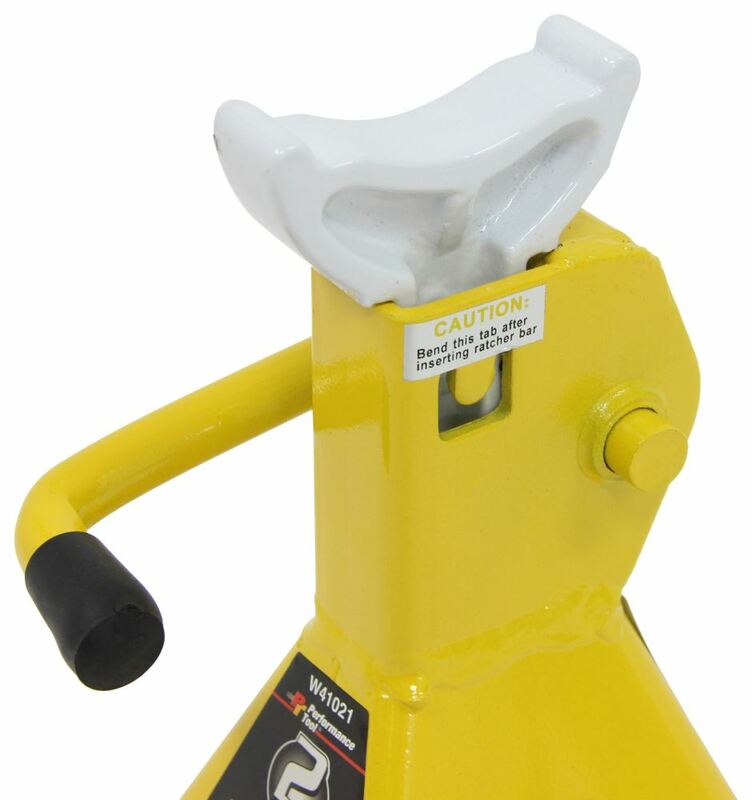 Performance Tool Bench Vise - 3-1/2"
Easily raise your car with the push of a button. This electric jack includes a 12' cord that plugs into your vehicle's 12-volt DC outlet so that you can even use it on the side of the road. Lifts 5" to 14". Today we're going to be taking a look at Part Number PTW41021. 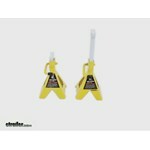 These are the Performance Tool 2 ton jack stands. 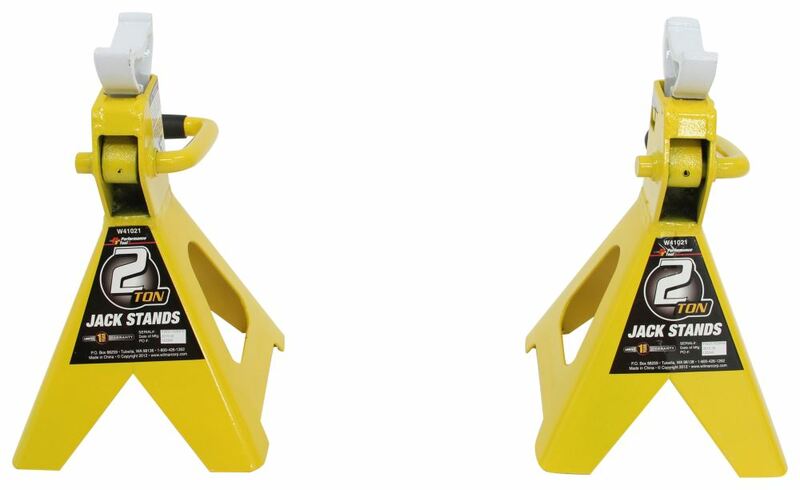 The jack stands are designed to position under your vehicle or trailer at points specified by the vehicle manufacturer that way you can make sure you get these at the proper load support points. You've got the ratchet column right here, so it's got the ratchet design for easy adjustment. Then you're going to have this control lever that's going to lower or rise. With it in the rise position, that's going to allow this to move freely and then with it in the lowered position, that's going to lock the ratchet column or center column in place. So it's nice that those ratchets are here on the center column for safe operation. 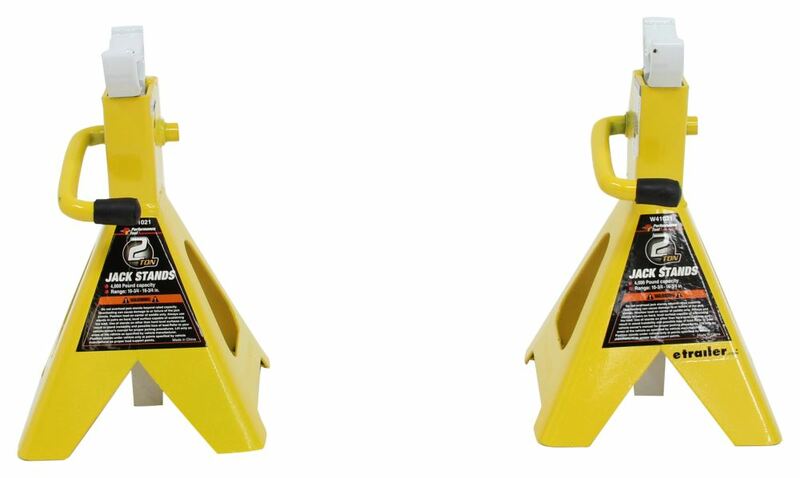 You always want to be sure to use your jack stands in pairs. These are going to be made from a steel construction with a tough enamel finish. The jack stands are going to be yellow in color and the ratchet columns are going to be white in color. Each stand is going to have a capacity of 4,000 pounds. The minimum lift height, which is going to be this right here, is going to be 10 3/4" from the ground to this area right here. If we have it all the way extended, which is in this position right here, that's going to give us a maximum lift height from the ground to this point right here of 16 3/4". We're going to take a measurement of the base. Measuring this direction outer edge to outer edge. That's going to give us a measurement of 6 11/16". Measuring this direction outer edge to outer edge. We're looking at 6 15/16". With this part number you are going to get 2 jack stands. Very simple operation. What you would do is you'd position the stands under your vehicle with your vehicle already lifted in the air and then you can either just pull this up because it's got the ratchet design or you can lift up on that control lever and adjust these where you need the saddle to make contact with the vehicle. So get that to the desired height or just underneath contact with the vehicle, push the control lever down to lock the pall 00:02:25 into place and then you can make sure the pall 00:02:28 is full engaged in the teeth and then simply and carefully lower the load onto the stands and it's going to do a good job of supporting it. Now one thing I do want to mention is right here there's a sticker that says "Caution" and then there's a small little tab. It says that you want to bend this tab after inserting the ratchet bar. That's going to keep the ratchet bar from being able to be fully removed. So right now you can see I can fully remove that With that tab bent, it's going to catch on this little raised area here and that'll keep it from being able to be fully removed from the actual stand. That's going to do it for today's look at Part Number PTW41021..
Can Trailer Hitch for 2011 Toyota RAV4 be Installed in Garage? The Draw-Tite Trailer Hitch Receiver # 75235 can be installed on your 2011 Toyota RAV4, though being unable to lift your vehicle will make it more difficult. 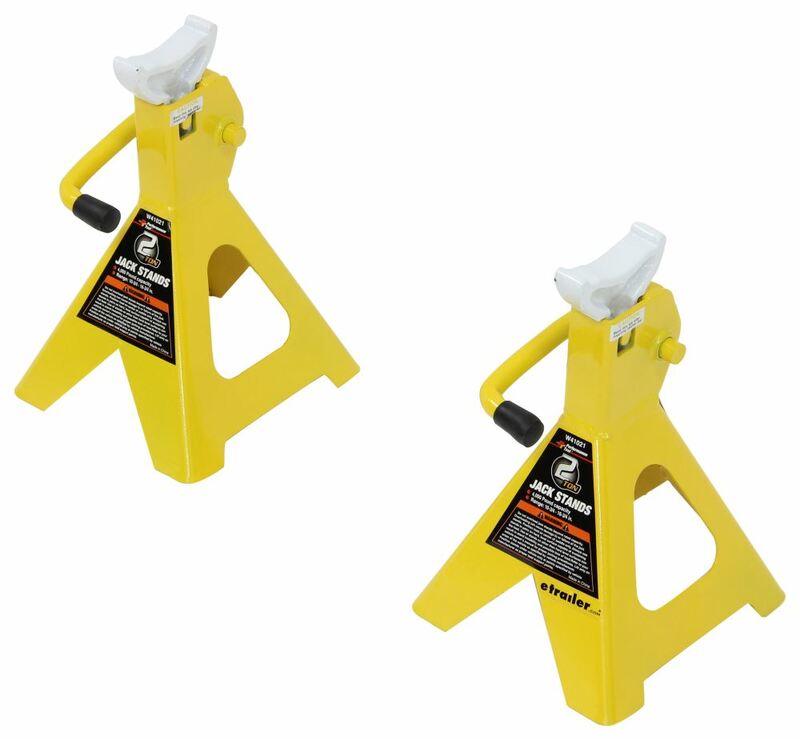 It is certainly possible, especially if you use something like the Powerbuilt Unijack Bottle Jack with Built-In Jack Stand # ALL620471. Just be sure to lock the jacks in place, and you may even want to use additional stands # PTW41021. The best way to change a wheel on your fifth wheel trailer is to use the Andersen Rapid Jack, part # AM3620. You will pull the vehicle up on the # AM3620 so that the other wheel is about an inch off the ground. I have attached a link to a video that shows how the # AM3620 jack is used. It is always a good idea to use jack stands like part # PTW41021 as well. Having the jack stands under the frame while you change the wheel gives you added security. 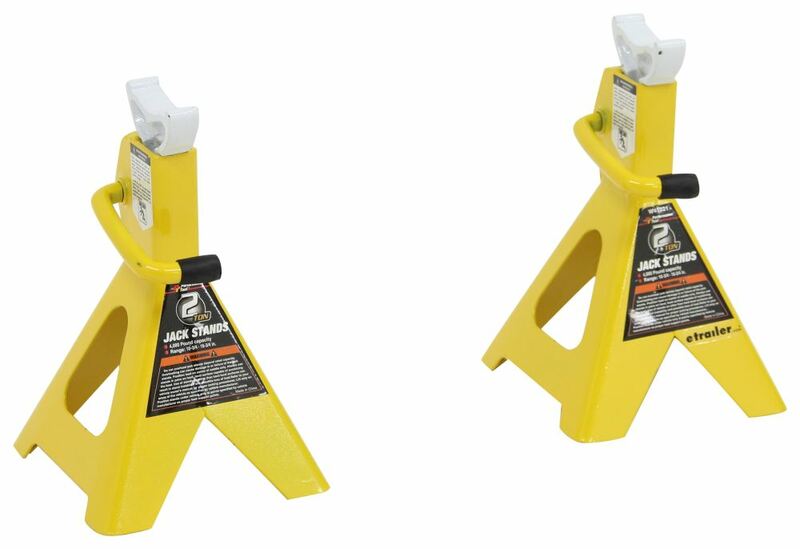 For your boat trailer, to keep the weight off the tires for storage, I recommend the 2-Ton Jack Stands - Qty 2 # PTW41021. Each jack can hold 4,000 lbs, but I recommend using 4 of these spaced as evenly as possible to keep the weight off the wheels and then just use the trailer jack for a 5th point of support and balance. 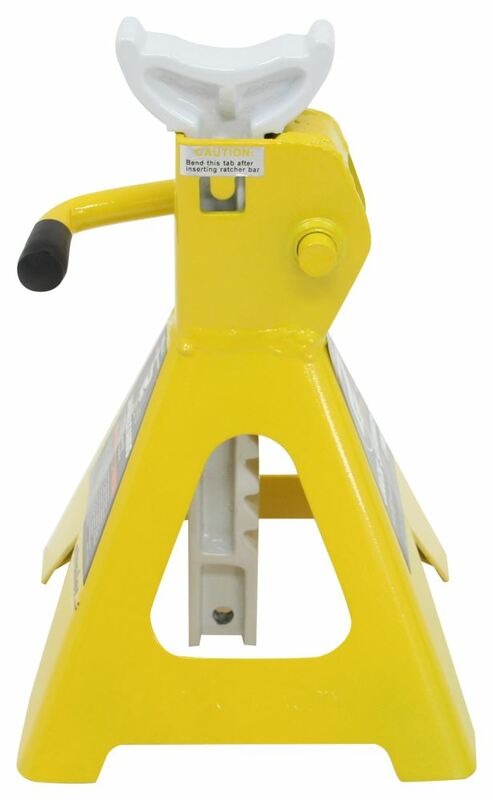 The Buffalo Tools electric car jack # BTEJ212 is rated for 2,000 pounds. Since it is only lifting part of the vehicle and not the whole weight of the vehicle it can be used to change a tire on your 2014 Honda Odyssey. Once you have the vehicle up high enough it should then be let down on jack stands such as # PTW41021 since jacks are not meant to hold the weight by themselves. Assuming you are using a floor jack to raise the trailer and then use jack stands, such as # PTW41021 for a pair, then you could store the trailer that way. 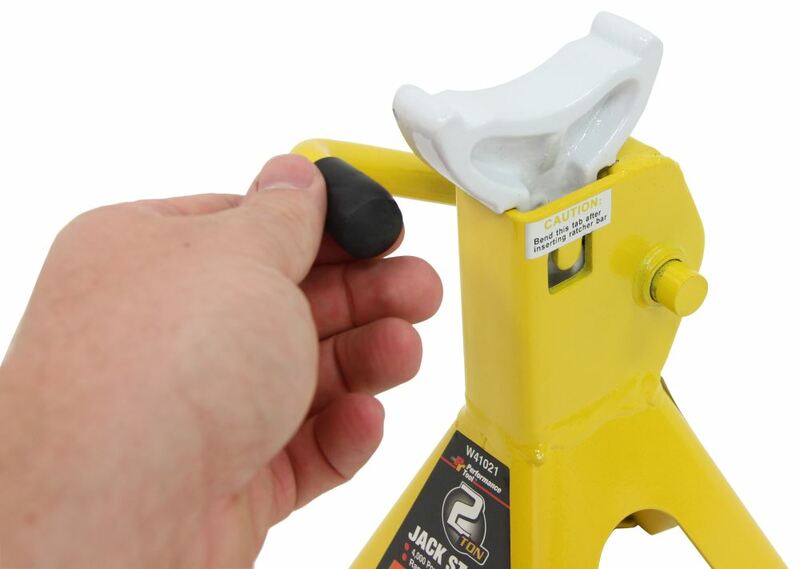 A jack itself should not be used to hold a load for extended periods of time. I really wish Kat's would give us that information but they don't have that specific of install instructions for their block heaters. Best option we can point you towards is to check out the engine block in the area Kat's recommends for the install and determine if you think it would be easier from above or below the engine. If you end up jacking up the vehicle use jackstands like part # PTW41021.